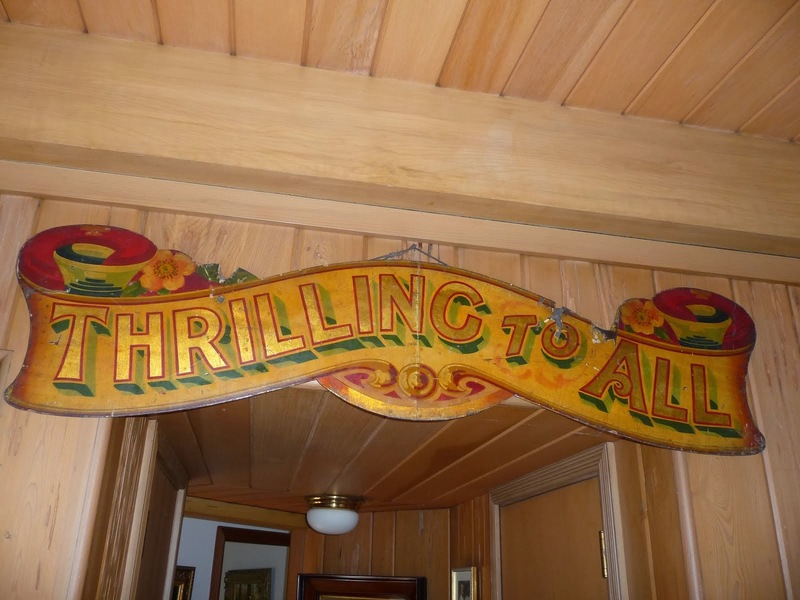 One great reason to be an antiques dealer is that one is always finding interesting things that are unexpected or that one knows nothing about. Take these photographs for instance. 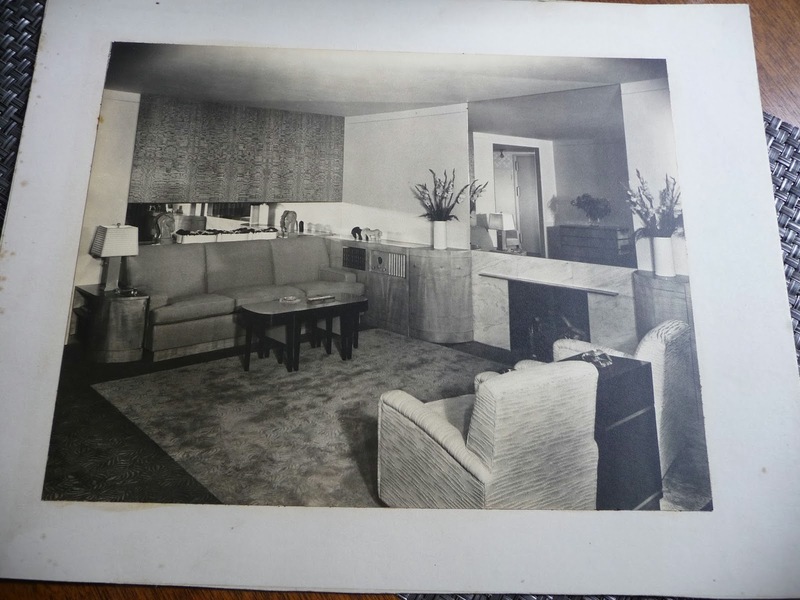 We purchased a collection of vintage black and white design photos recently from the estate of the architect Paul MacAlister. 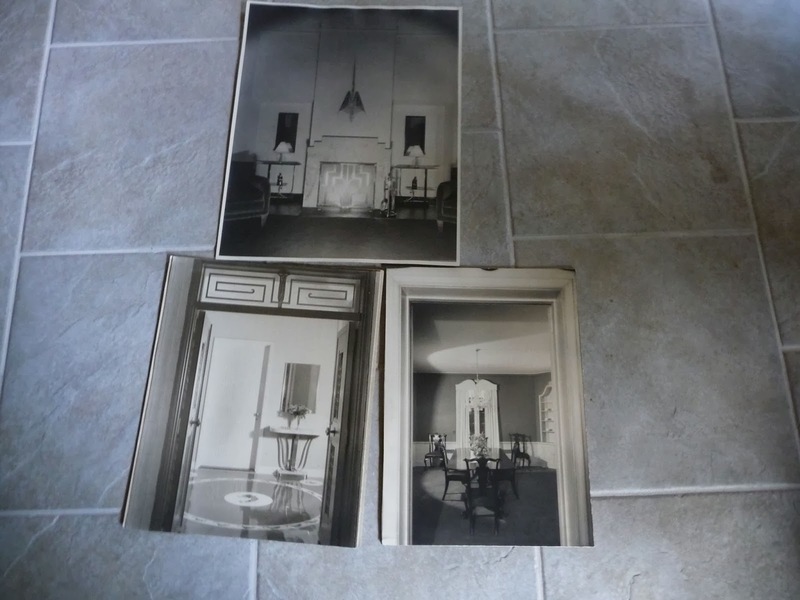 He was a famous designer who was a favorite of Cornelius Vanderbilt and designed interiors of their many apartments in New York. 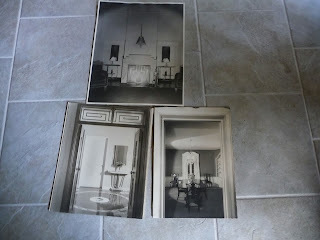 Many of the photos are of the moderne period--after art deco in the late 1930s. 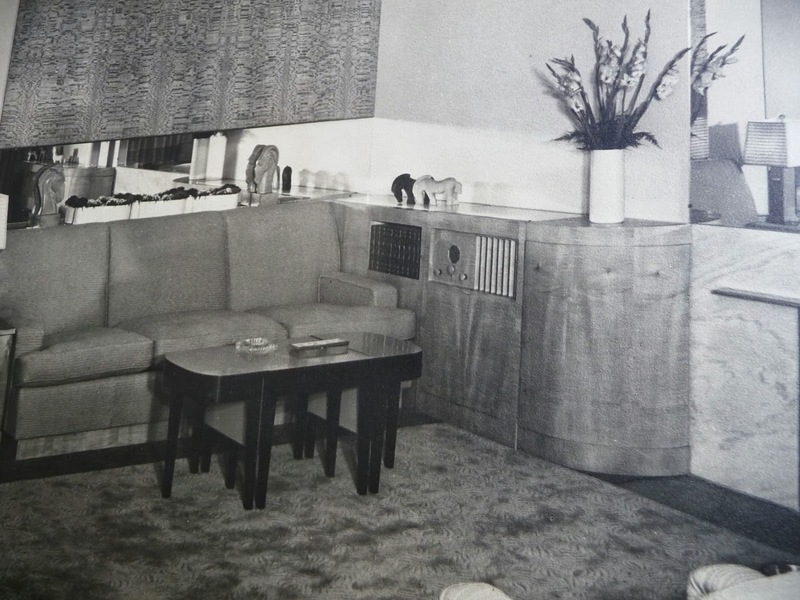 Think Nick and Nora Charles of The Thin Man movies type of furniture. While art deco was angular, moderne had some roundness to the look. I will put my hands on some more photos--including a bathroom with sea life on the walls and a dining room with custom chairs that depict different African animals. Really quite timeless and quirky--and show off so much better in black and white. 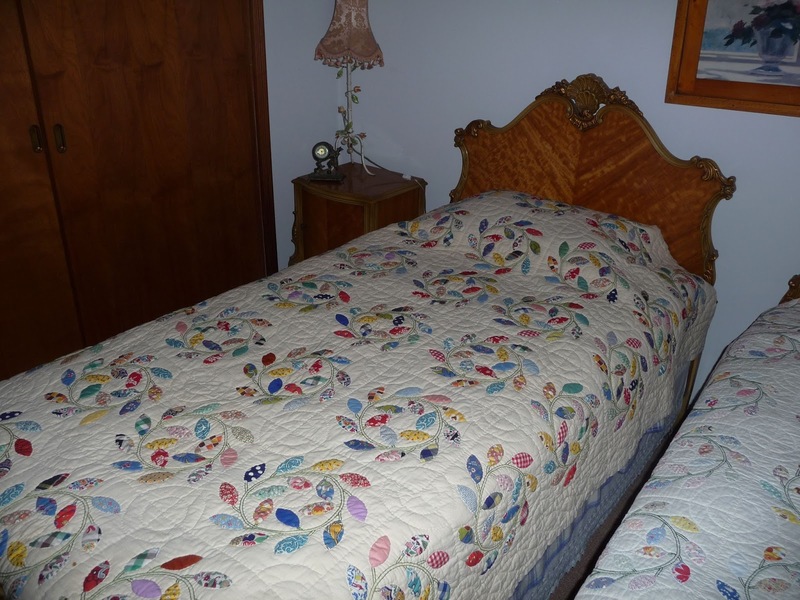 Do magazines show beds made with patchwork quilts anymore? I don't sew, and have never quilted and have no onterest in learning to do so. I have a couple of friends who love all things quilt--and they make beautiful ones and they are real works of art. For 25 years of my life I slept under a quilt of one type or another. Winter, Summer--my childhood homes had quilts for all seasons. 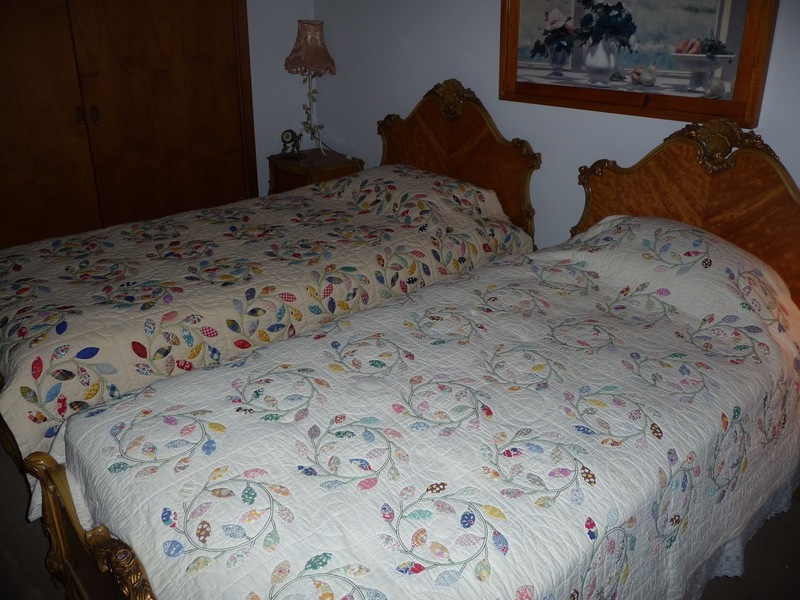 I am now the owner of two twin bed quilts that were made by my great grandmother. And they are pristine. A friend identified them as "Wreath of Leaves" pattern. They are in perfect shape--no tears or stains or rips. Lovely. Probably made in the 1920s-30s by the looks of the fabric. Quilts just say all the nicest things of years gone by. They have personality and stories to tell--of the hands of the women who made them and the origins of the fabric swatches. 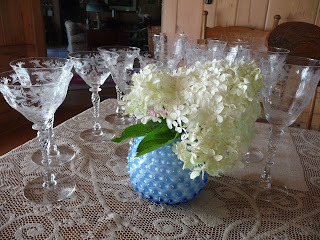 More than anything to me--they speak of crisp late summer nights when you kept the bedroom windows open, and had a kitchen cupboard filled with tastes of summer "put up" in ball jars. Our guest bedroom has two twin beds and Great Grandma's handiwork is gracing them. What a treat for me. 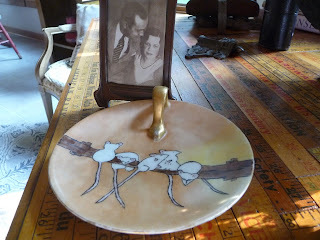 It is not often that wonderful, previously unknown family antiques fall into your lap. But recently my lap has become quite full with an unexpected, out of the blue windfall of Grandmother and Great Grandmother antiques. Actually Grandmother and TWO Great Grandmothers. How I came by them is not particularly important. One of those "family situations" that every family has but would prefer Not To Talk About Thank You Very Much. Let's just suffice to say, I have become custodian of some wonderful things. My mother is enjoying telling me stories about all of them--and I am sorting through all sorts of things. I love to entertain--and my china. 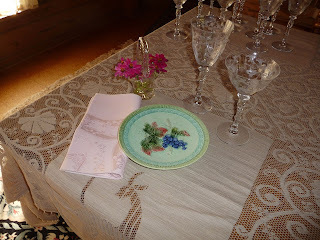 glassware, serving pieces and decorative items have taken a major step up--as I sort through fostoria, silver, china and lovely entertaining grace notes. 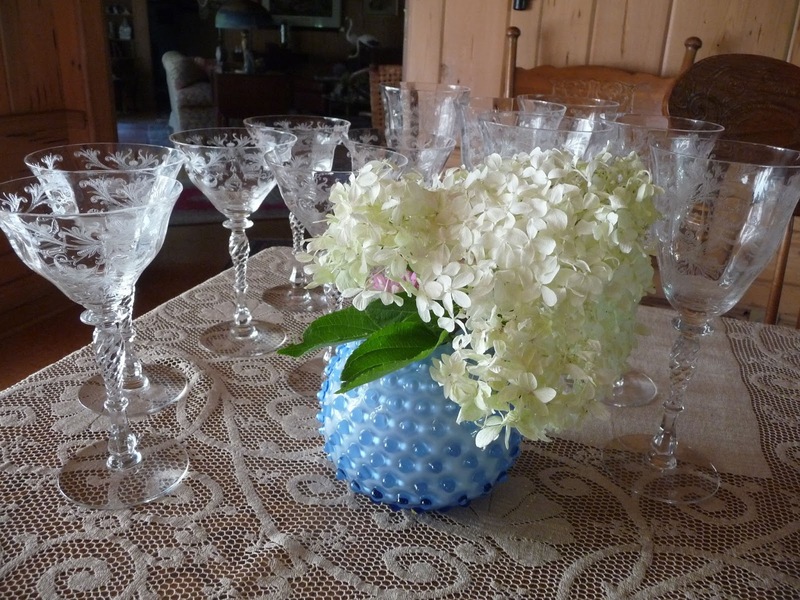 Lots of 1900s-1940 linens, majolica and a beyond fabulous victorian cut glass cake pedestal. Look at this little treasure. Signed on the back by my Grandma as a child--a decorated "nappy" sweets dish with little mice drawn on it. In its day, a favorite pasttime of society ladies and children was to paint blanks of china pieces. I have learned that my Grandma did grow up quite the society little girl. Part of my stash includes several photo and clipping albums--my Grandma as a small girl had a little circus put on for a birthday party. It has been an emotional month with the uncovering of the treasure and learning the stories. I am culling out some of my marginal entertaining pieces and happily replacing with my new stash--from an age when ladies certainly knew how to entertain. Dear Husbola even planted a peach tree in the back yard and we got a great little crop and had the most delicious sliced peaches one evening. I have always been attracted to vintage fruit pictures and buy them when we find good ones. 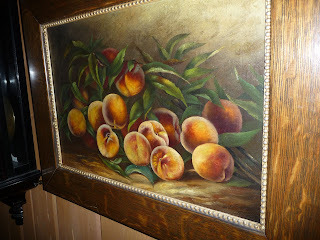 This oil on canvas is currently hanging in our dining room. I say currently--as it will find its way into the shop one of these days. The color is terrific and the vintage beaded oak frame is a perfect compliment. 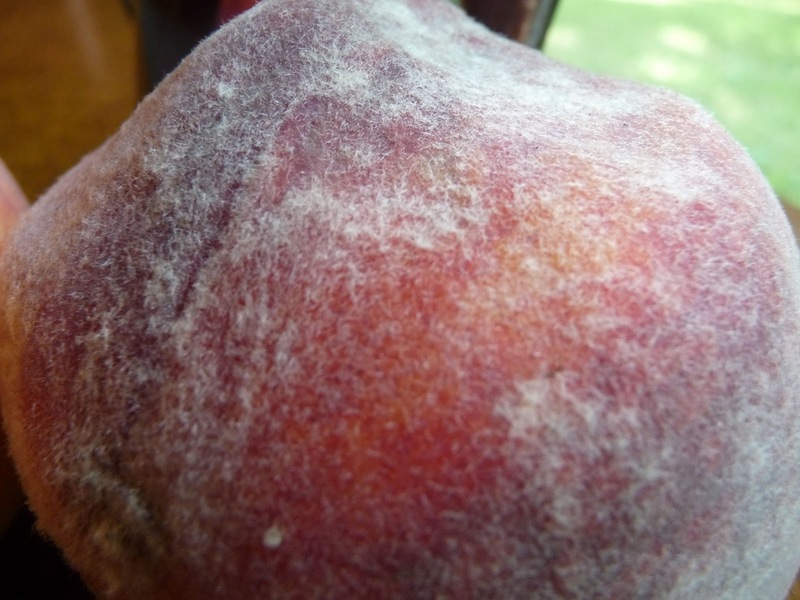 Didn't peaches used to have peach fuzz? Today's supermarket peaches do not. 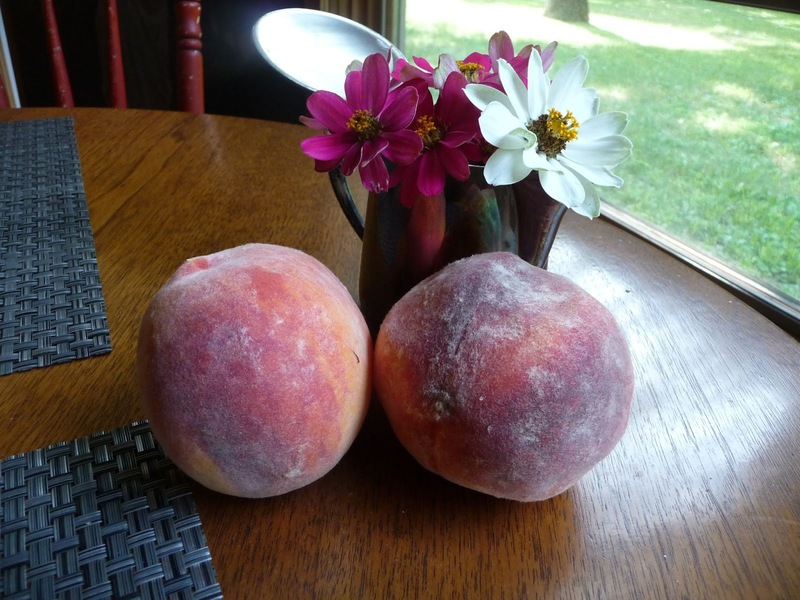 But these big peaches DO have fuzz and I bought them at Caputo's. They had a HUGE wooden crate from Michigan and were selling these treasures for 99 cents a pound. These are the "bite into them juice runs down your chin" kind of peaches. This peach has serious fuzz. This is a piece of Italian majolica pottery that I just acquired that belonged to my maternal grandmother. 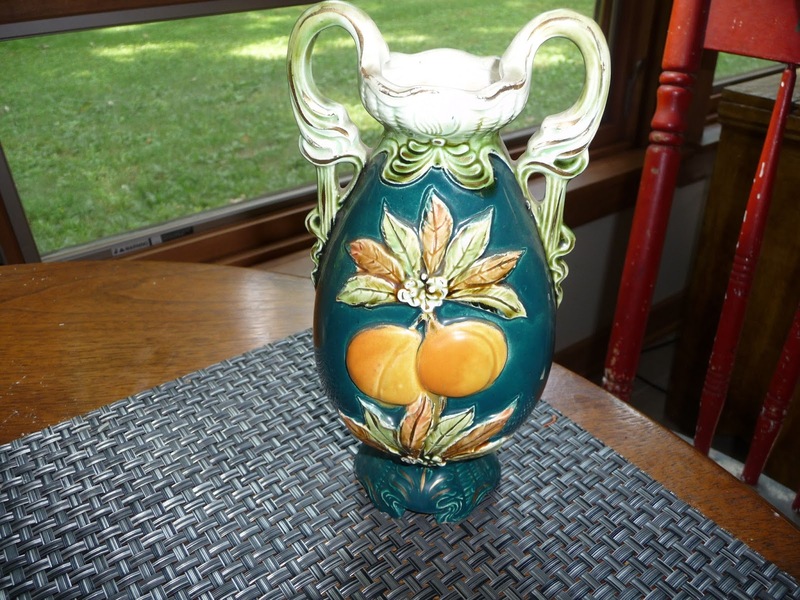 I do not remember the vase in her house--but I do remember the home made hand cranked peach custard that was an important part of summer vacation. I do sound old as I say that I am sorry that children of today miss out on incredible simple things like real peach fuzz. Remember how adults used to rib young boys who were starting to get facial hair and say they had "peach fuzz?" I wonder how many kids today even know what that means.